Now that you’ve connected your accounts, you’re ready to schedule a post. 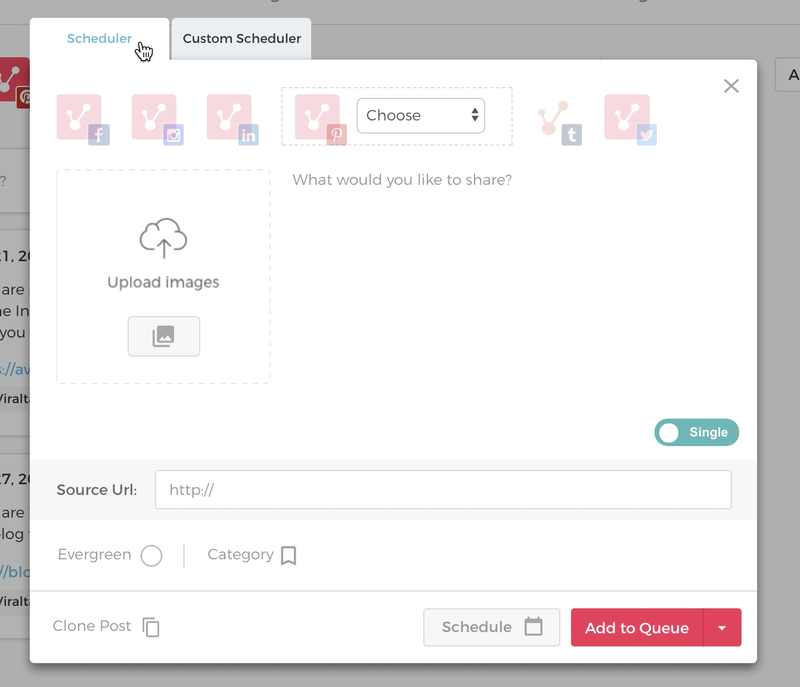 You can use our 'Scheduler' or 'Custom Scheduler' to schedule content. 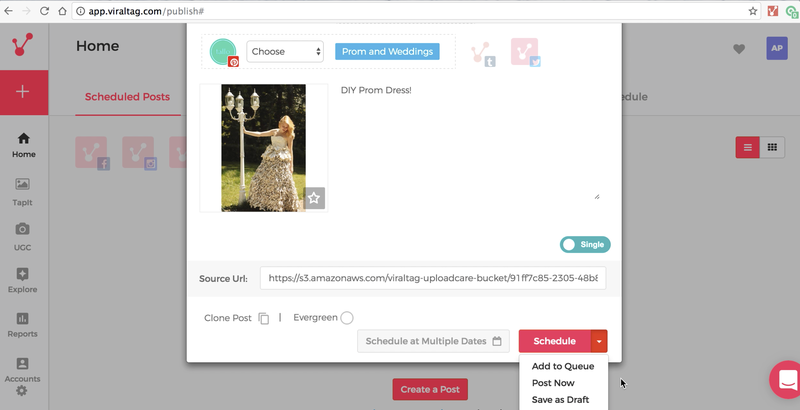 This article goes over how you can use our Scheduler. Click on the "+" button, which is located on the left hand side of the screen or the 'Create a post' button. 2. The scheduling window opens up. 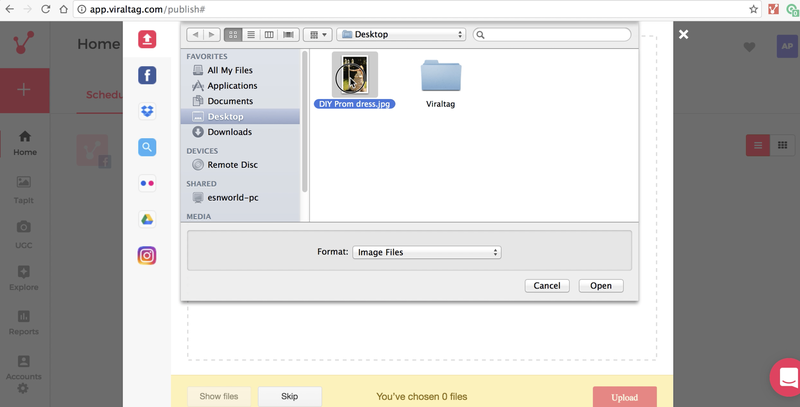 Here, click on the 'upload images' icon. 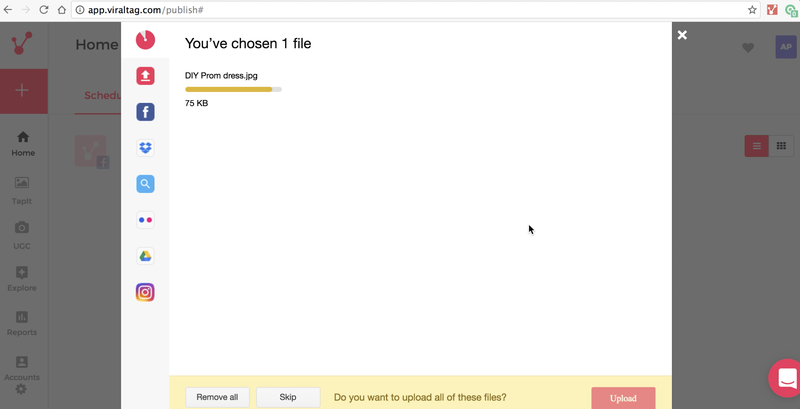 In this section, we will show you how to upload images from your computer. 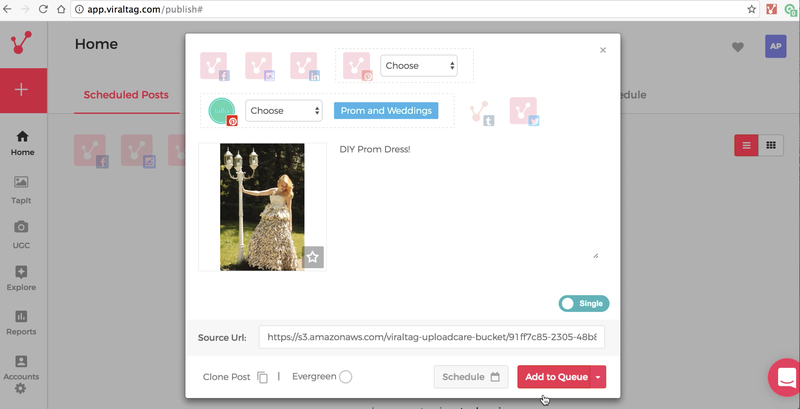 Check out the Upload your image section to read about how to upload images from other sources. Click on the 'Upload' icon on the left hand side of the window or click on "Select images from computer". 5. Choose the social accounts you would like to post this image to. 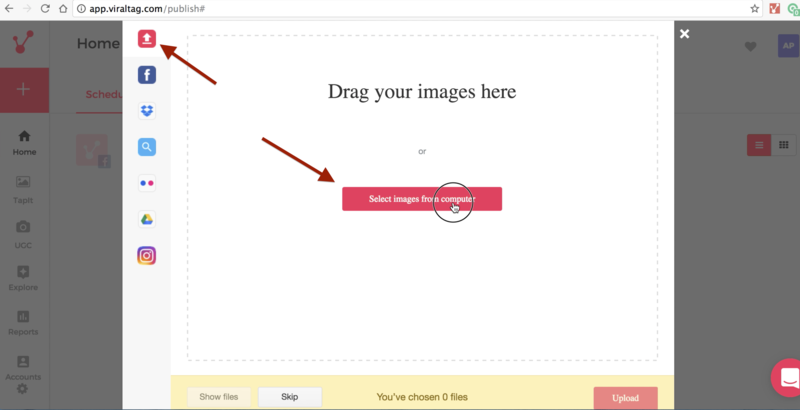 You can select one or multiple accounts for your image to be posted. All your unselected accounts will appear faded. When you select on your desired account, it will appear in focus. 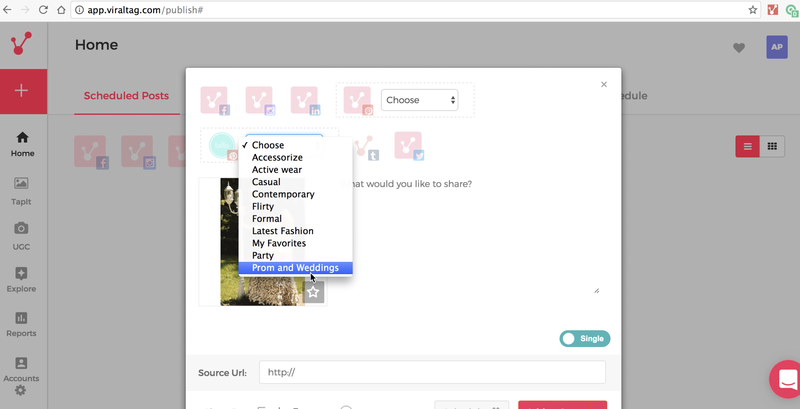 If you wish to post to multiple boards on Pinterest, click on the drop down next to the Pinterest icon. It will show you a list of all your boards. Select the board that you wish to post to. You can select as many boards as you like. All your selected boards will appear next to your Pinterest account icon. 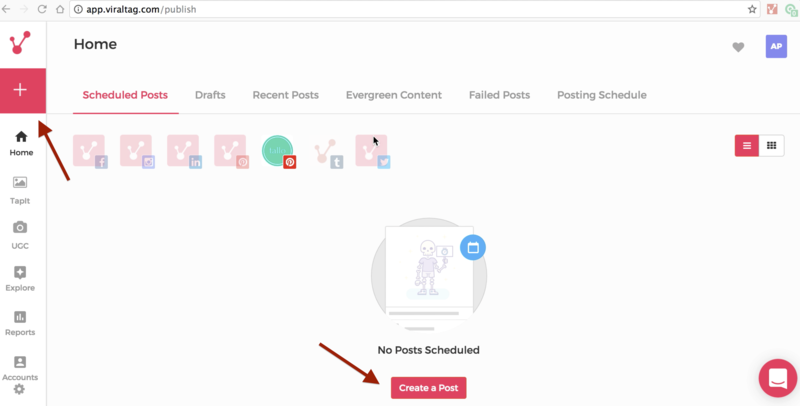 If you change your mind and no longer want to post to a board you selected, simply place your cursor on the board and click on the "x" that appears on the top right hand corner of the board icon. Write a caption you would like to go along with the photo. On Twitter, this is the content of your Tweet. On Facebook this is the status message that appears with photo. On Pinterest, Tumblr, and Instagram, this is the caption that appears with your photo. Include any relevant hashtags here, too. Twitter is the only network with a character limit for your descriptions. Once you select Twitter as an icon to share to, a character count will appear under the Description box telling you how many characters you have left. You can enter a URL link to go along with your image if you like. On Twitter, this link is shortened to fit in your tweet. On Facebook this link is posted along with your photo. On Pinterest and Tumblr, this link will be embedded in the photo. In other words, clicking your photo sends someone to the link you attach here. Adding a link is optional and not used on all networks. Since Instagram does not have a place for links, any link added on a post to Instagram will not appear anywhere. Note: To post to Facebook as an image only, leave the link space blank. You can add a link within the description and it will appear as a live link in the status message of your Facebook post. To post to Facebook as a link post, enter a link in the link box. You have three choices on WHEN to schedule your post here. 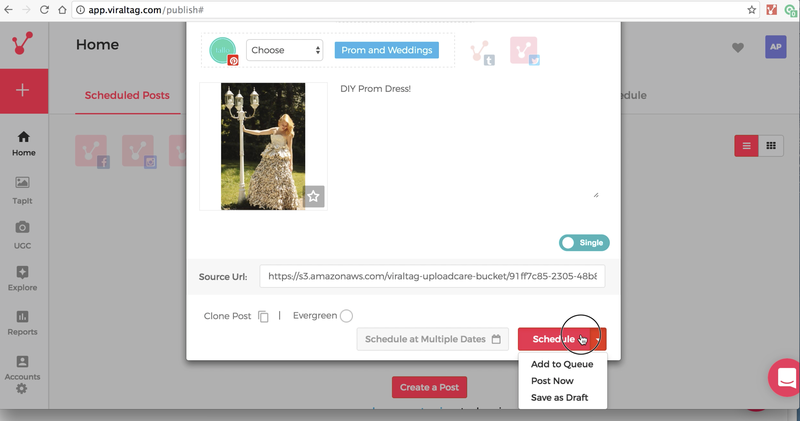 You can choose to post right away, you can post at a later date and time, or you can add it to your posting queue. 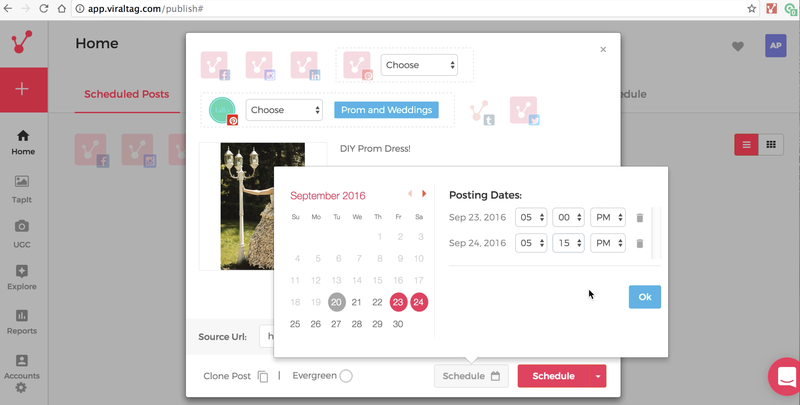 Click on your desired date on the calendar that opens up and set your desired time. You can select more than one date and time if you would like the image to be published multiple times. Click on 'Ok' once you are done setting the date and time for the posts. iii. To add the post to your posting schedule queue (and not choose a specific time), select the "Add to Queue" option that appears in the drop down menu when you click on the arrow next to 'Schedule'. This will post your image according to pre-set times. 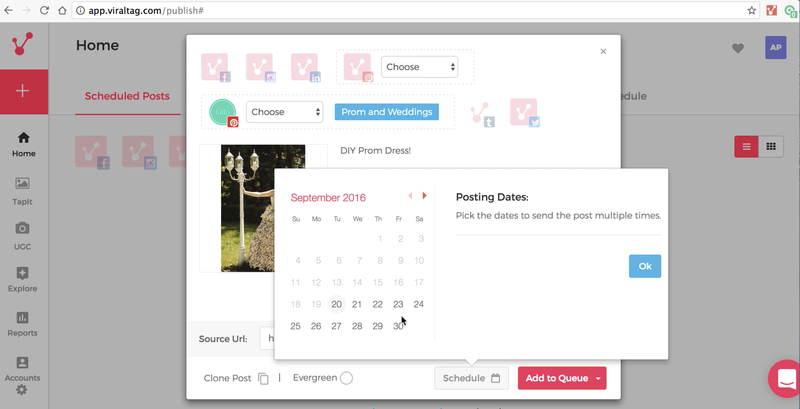 To learn how to set up your posting schedule, check out the Posting Schedule section. Or you can save it as a draft if you'd like to come back to the post at a later time. 8. Once all the details have been entered, click on the "Schedule" button. 9. 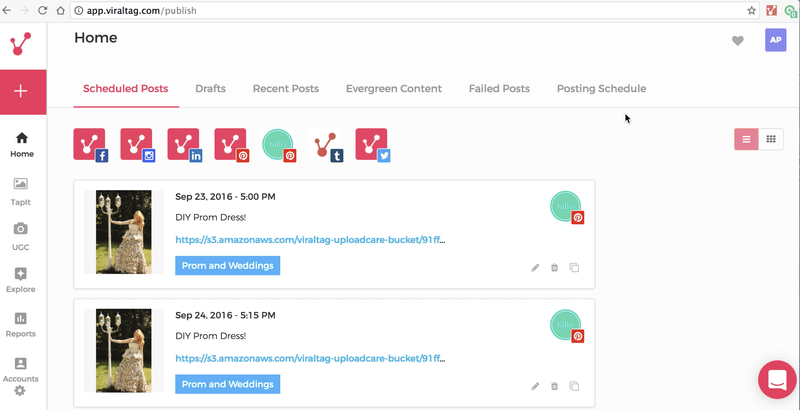 You have successfully scheduled your posts and can view your posts in 'Home' section. Click each network icon on the "Scheduled Posts" tab to see what you have scheduled for each network.